For decades I’ve made the same Easter dinner. Every year I read about new, trendy combinations, fresh starts. Yet I return time and again to the now almost sacramental supper of the lamb. It’s a once a year feast, the whole leg, stuffed with garlic and rosemary, cooked on the bone, roasted medium rare and thinly sliced lengthwise into rippling pink ribbons. It’s a meal so ancient no one knows its origins: desert herders or mountain farmers? We step back in time when we come to this table. Last year before Easter I waited for my leg of lamb. Bill, my butcher, promised to hold a small one when it came in and sure enough at almost the last minute I picked up my slender 8 lb (from shank end to hip) leg. I sawed off the bonier sirloin end, cut the meat into kebabs, and saved the bones for stock. My final “gigot” weighed 6 lbs. I trimmed off mini-bits of excess fat and studded the whole leg with slivers of garlic and tufts of fresh rosemary. Dusted with freshly ground black pepper, the wrapped lamb waited in the fridge until noon the next day. Two hours before roasting I drizzled it with olive oil, sprinkled it generously with kosher salt, and let it come to room temp. Strawberry/rhubarb pie went into the oven first. Next came the pan of scalloped potatoes that when cooked waited under a towel when it was time to bump up the temp for the lamb. After exactly an hour and fifteen minutes the lamb was done and ready to rest half an hour before carving. I scraped the browned mirepoix into a saucepan, added a quart of good stock and set it to simmer for the sauce while we drank a bottle of champagne in the afternoon sun. 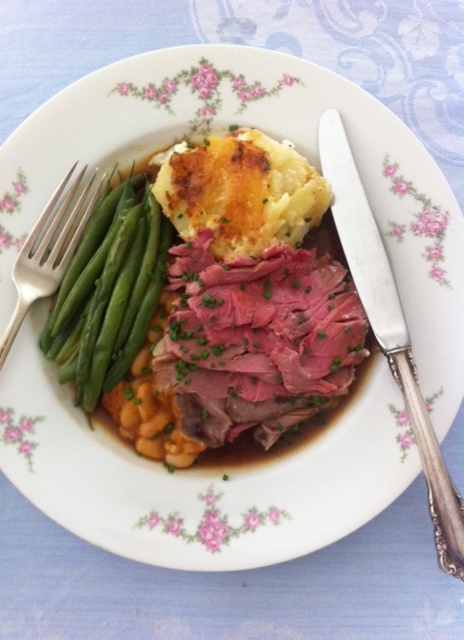 Green beans tossed with butter, warm potatoes dauphionoise, rosy sliced lamb, and a dark brown sauce. Dinner is served, everyone inside, time for the Easter lamb. 5-7 lb. 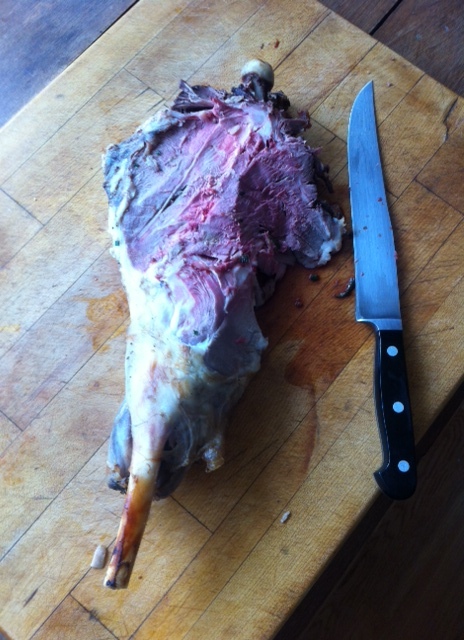 bone-in leg of lamb with shank attached. Trim lamb of excess fat. Cut peeled garlic cloves into splinters and remove rosemary needles from sprig. Use small, sharp, paring knife to make deep holes in meat. Widen each hole with finger, and push sliver of garlic along with 3 rosemary needles in each hole. You will need to insert 15-20 slivers of garlic all over leg of lamb. Rub lamb with olive oil; sprinkle generously with salt and pepper. Set aside at room temperature 2 hours before roasting. Slice onion, carrot and celery; add a few unpeeled garlic cloves. Place vegetables diagonally over base of 10-by-14-inch roasting pan. To prepare sauce: Lift lamb from roasting pan and pour off excess fat. Remove any vegetable bits that have burned. Pour in stock to soften all browned bits. Scrape cooked vegetables and stock into saucepan. Bring to low boil and simmer 5-10 minutes to intensely flavor stock. Crumble in roux, whisk to dissolve, and simmer to richly flavored sauce. Add fresh lemon juice to taste and correct seasoning with salt and pepper. Strain sauce through a sieve before serving. Carve lamb in thin slices lengthwise in direction of the bone. A 6 lb. leg of lamb will serve 10 and still have leftovers. Supermarkets are rolling out mountains of green cabbage, bakeries icing cupcakes luminous green, to tempt Americans who plan to eat corned beef and raise a ruckus on St. Paddy’s Day. Meanwhile, from Dublin to Dingle, families will have a quieter bank holiday, go to church, and settle around a roast turkey dinner. Legends of fifth century St. Patrick abound as he brought the gospel to native Celts, drove snakes out of the Emerald Isle, and used the three-leafed clover to explain the Trinity. Corned beef is more American than Irish, and it was promoted by our East-Coast Irish immigrants, who salted cheaper cuts of beef to emulate their version of bacon: brined pork loin. Even now at least a decade after Ireland’s food renaissance, many don’t realize the bounties of goodness that await the traveler. Americans who think an Irish dinner means boiled potatoes and soggy cabbage will have a jaw-dropping experience due to Ireland’s culinary revolution. The island’s patchwork of green pastures produces the best of butter, farmhouse cheeses to rival the French, garden produce nurtured in the rain, grass-fed beef and lamb, the freshest seafood, and the world’s premium smoked salmon. Common Irish veggies like potatoes and cabbages are way ahead of what we buy in our winter markets. Ireland’s mild climate allows harvesting to continue pretty much year round. Farms border towns and cities, so produce doesn’t travel far. Spuds are dug close to selling time, come to market with dirt still on them, and have such rich flavor they can easily be the “center of the plate.” Sweet green cabbage is seldom simmered in lots of water until soft; instead, it’s shredded, cooked with a little butter for just a few minutes. We’ve shied away from cooked cabbage after bad experiences with the mustard gas smell from overcooking. Quickly prepared cabbage is a distinct vegetable experience—it’s for more than coleslaw. This week, why not buy a crisp green head, shred and quick-cook one of the tastiest (and cheapest) greens. Your Irish eyes will be smiling. Quarter the cabbage, cutting from the top through the core. Cut away the core and thinly shred the cabbage. 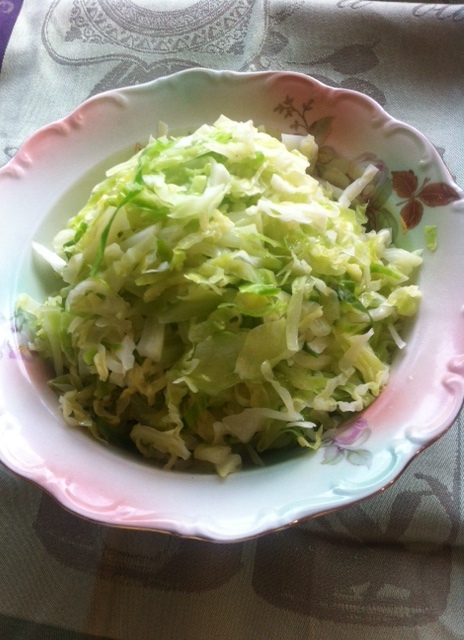 There will be about 8 cups shredded cabbage. In a heavy four-quart pot bring 4 fl. oz. water, 2 tablespoons butter and a good pinch salt to a boil. Add half of the cabbage turning it in the hot butter with a tongs. Add the second half of cabbage and combine it with what you’ve buttered. Cover and cook over moderately high heat for 5-7 minutes, turning it a couple of times with tongs. Add a little water if cabbage seems dry. When it’s tender, taste for seasonings, adding more salt if needed, and stir in another tablespoon of butter. Serve it, sweet and tender, to 4-6. You are currently browsing the Mary Jo's Kitchen blog archives for March, 2015.